NATIONAL Leader of the All Progressives Congress, APC, Asiwaju Bola Tinubu, yesterday, met President Muhammadu Buhari to assure him that negative fallouts from the moves to stop a second term for Governor Akinwunmi Ambode would not affect the party’s chances in the 2019 presidential election. 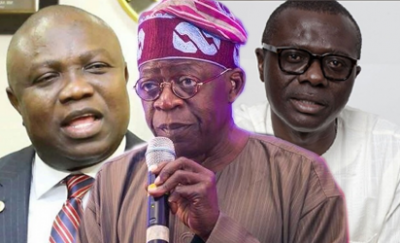 Tinubu’s meeting with Buhari came as it emerged that last Sunday’s press conference by Ambode where he harangued his rival, Babajide Sanwo-Olu derailed a last-minute intervention by President Muhammadu Buhari to salvage his prospects. Meanwhile, the National Working Committee, NWC, of the party again shifted the governorship primaries from yesterday to today. Also yesterday, the chairman of the APC in Lagos State, Alhaji Babatunde Balogun, lamented the failure of the governor to pick his calls or grant access to him, a development he said had hindered the dispatch of the governor’s party membership card to him. 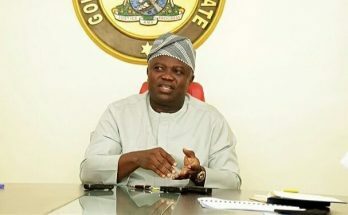 Rebuffing insinuations that the shift of the primary from Monday to Tuesday was upon a last-minute presidential intervention to help Ambode, a source close to the national leader laughed it off yesterday. “There was no summoning. There was nothing like the President summoning him; he (Tinubu) sought for the appointment himself, and I am not even sure that the governor (Ambode) is going to be there. There is nothing like him being summoned. Another source noting the absence of further interventions on behalf of Ambode said that the governor shot himself in the foot with his press conference on Sunday. “That press conference exposed him and stopped everyone that had been involved. The president had prompted the NWC based on calls from several quarters to see what could still be done and they were to meet with the parties in Lagos, but that press conference put everyone off. “The trip had to be called off, and he exposed himself that he wanted to fight the system, and that press conference exposed him,” a high-level source in the party said. Meanwhile, the chairman of the state chapter of the party, Balogun yesterday clarified issues pertaining to Ambode’s membership card. The governor had alleged that he had not been issued with membership card hours to the primary election. Balogun countering the claim, yesterday, while displaying the green party membership card, lamented that every effort of his to officially deliver the card to the governor had proved abortive. “In the last 24 hours, I have been on the trail of Governor Akinwunmi Ambode as the party chairman with his party card with me. But unfortunately, all my calls have had no response. This is unfortunate. A few hours ago, I sent him an SMS telling him about this. I made several calls which were in vain. “I was able to get his Aide-De-Camp, ADC, to inform him about this. I still don’t know how to get this to him. I want to apologise, but I made efforts to get the card to him in the last 24 hours. “The cards were brought in about five days ago. After the sorting which was according to Local Governments and wards, the card was brought to me. I called him in the last 24 hours, but I cannot get him. “Out of respect, the party chairman has to accord the governor the courtesy. I will ensure that he gets it. I am positive about this. Whenever I know his whereabouts, I will surely go there and hand it over to him,” Balogun added. Ambode had petitioned the National Working Committee, NWC, that all party members with genuine membership slip be allowed to vote. “Many of our members do not have the permanent card,” he had alleged. Meanwhile, due to communication problems, the primary election took place in three local government areas before officials, and party faithful knew that the primary had been called off. The councils where election reportedly occurred before it was later suspended were: Yaba, Ikorodu, and Ojokoro. There were reports of fisticuffs between supporters of Ambode and Sanwo-Olu before policemen intervened. I have the authority of the State Chairman, Alhaji Tunde Balogun to inform you of the postponement of the Gubernatorial Primaries that was supposed to take place today (October 1st, 2018). At the Acme state secretariat of the party, heavily armed policemen were stationed both within and outside the premises, apparently, to ward off possible break down of law and order by miscreants. At about noon, members of the election panel from the national secretariat arrived and went straight to the office of the state chairman Balogun where they had a brief meeting with him before they departed to meet with Ambode at the State House, Alausa, Ikeja. The governor, who received the seven-man committee led by a former governor of Cross Rivers State, Mr. Clement Ebri, at the State House, Alausa, Ikeja, expressed confidence in the panel saying that the party must live to its reputation. Noting his observations, he said: “There were issues that we raised that we are also trying to correct. The bottom line is this; we are one family, we must not go into the elections divided because this is the very first time that our party is controlling the centre and also the state that is what I want us to continue. Earlier in his address, Ebri said that more members might be deployed to the State for effective conduct of the primary. Other members of the committee deployed to conduct the poll were Alhaji Ahmed Mahmud Gumel as Secretary; Mr. Nze Chidi Duru; Chief Clever Egbeji; Senator Clever Ikisikpo and Ambassador Jerry Ugokwe. 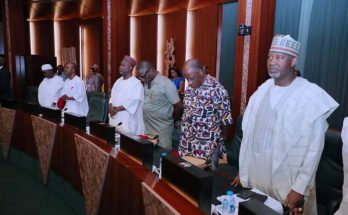 Meanwhile, a principal officer of the State House of Assembly, yesterday, dismissed insinuations of the threat of impeachment hanging on the governor. The polity in the state had lately been wrapped with insinuations of a plot to impeach Ambode should he forge ahead to contest today’s primary. Meanwhile, factional chairman of the party, Fouad Oki, yesterday described the current crisis in the party as “worrisome” and urged the national leadership of the party to intervene. “When family members are in conflict, is it not the responsibility of family members, especially the elders or those who care deeply about the well being of the entire family, to make every attempt to solve the problem,” Oki said at a press conference, yesterday. Also yesterday, hundreds of protesters claiming to be APC members, stormed the party’s Secretariat, Ikeja, protesting against the guidelines set by the National Working Committee, NWC, for the primary in the state. The protesters stormed the party secretariat at about 4:30 pm few hours before the seven-man committee assigned to conduct the primary arrived the secretariat to address stakeholders on modalities for today’s poll. They explained that their major grievance with the guideline was the plan to use the party permanent membership card as against the slip which according to them a significant proportion of party members do not have. Speaking on behalf of the protesters, Kolawole Okedara alleged that: “Since they have decided to hoard the card, then they must allow everyone that could present the party slip to cast their vote for the aspirant of their choice. Meanwhile, a party chieftain in the Old Badagry Division yesterday affirmed that he was backing Ambode on the fact that stopping him would dislocate the division from producing the governor in the nearest future. Meanwhile, the NWC and leaders of the APC in Lagos, yesterday, disagreed over the mode of voting to be adopted for today’s rescheduled primary. The meeting, which was in two sessions at the party’s Secretariat, Acme, Ogba, lasted for several hours and ended about 8.55pm.